RE•WORK | Blog - The Average Person is Served Over 5000 Adverts A Day: How do you Cut Through the Noise? The Average Person is Served Over 5000 Adverts A Day: How do you Cut Through the Noise? How many times have you been shopping online, filled up your basket and abandoned your purchase? This could be due to countless factors - you’re over budget and can’t decide what to get rid of, you were just browsing, you’re out of time, or you’re just overwhelmed by the sheer amount of choice on the website. E-commerce platforms are desperately trying to overcome this problem by serving personalised and targeted adverts based not only on your previous browsing history but on countless factors and data sets they’ve collected whilst you’ve been on their website. Both retailers and search engines are facing the challenge of an abundance of choice and to break through this and encourage purchases requires adverts to be deployed. Which platforms do you use? Who should you target? How do you target? AI, and specifically deep learning is a huge breakthrough with dealing with rich format big data - there are word embeddings, CNNs and recurrent neural networks which can handle image, video and sequential data, and Miao explains that these have huge potential when employed in advertising. Of course there are ethical implications of using AI in advertising, and this is something that every platform has to consider when building their models and using customer information. It’s no surprise to hear that the most successful adverts are those that evoke an emotional response as opposed to value-driven advertising - think the John Lewis Christmas advert - especially prevalent in video advertising! This is currently produces to appeal to the masses rather than based on customer profiles and activity, however the next step is for emotionally intelligent AIs to be built into advertising models, although the ethics of this is still questionable. 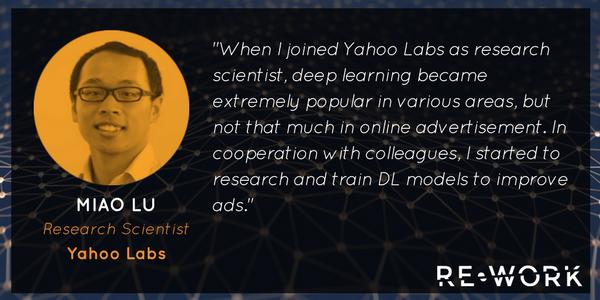 To learn more about deep learning in advertising from Miao register now for the Deep Learning Summit in San Francisco this January. Can’t make it to San Fran? Next March 15 & 16 the Deep Learning in Retail & Advertising Summit will be taking place in London where discussions will focus around the impact of deep learning and AI in the retail and advertising sector. Applications include computer vision for sizing; image analysis for shopping efficiency; and natural language processing for personalised shopping experiences. Confirmed speakers include Kostas Perifanos, Lead Machine Learning Engineer, Argos, George Platon, CTO & Founder, BuddyGuard, Yuriy Mukhin, Co-Founder, Lalafo, Honglei Li, Senior Lecturer, Northumbria University and many more leading names more to be confirmed.